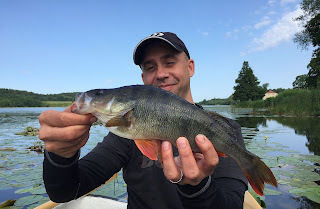 A long awaited trip the this famous Tench lake here in Sweden. The lake has a long history amongst anglers here for big, specimen Tench and the lake record stands over 9lb. Here in Sweden, given the harsh winters and relatively short summers, the species does not grow as large as it does in countries further south and a 6lb fish can be considered a specimen. 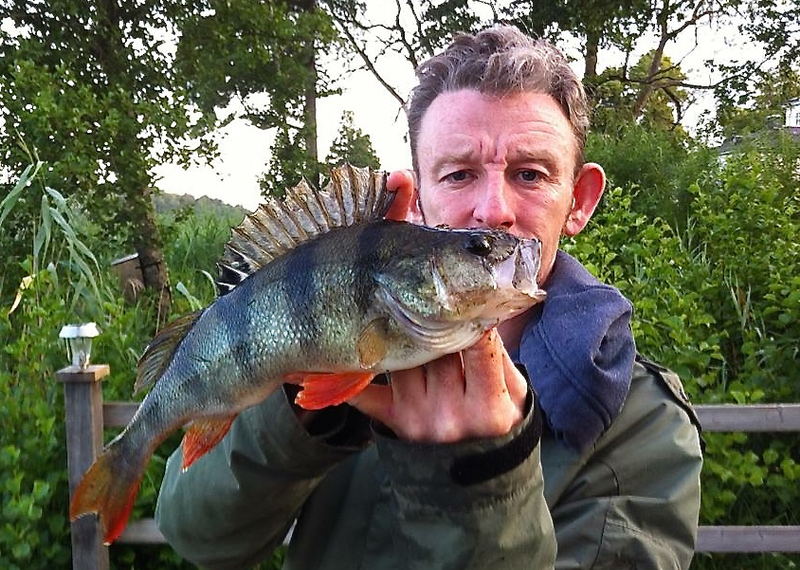 Having never fished the venue before we were not sure how to approach the fishing and brought a lot of gear and bait to cover all eventualities. Andy Shaw and I set off at midnight with a fully loaded car, in good spirits and looking forward to the fishing. After a difficult commute due to thick fog and deer on the roads we eventually arrived at 2am and had a look around in the darkness. The lake was a typical eurtrophic lake, with dense marginal vegetation and extensive lily pads. Fishing from the bank would be difficult and we only found one area suitable, though we were heartened by bubbling Tench in the swim and returned to the car and awaited a little more light. We were soon on the lakeside and opted for legering method feeder, a method we have had good success with in the past. This was a mistake as the lake proved to be thickly weeded under the surface and we decided we had to float fish. The next few hours proved frustrating as we struggled in which weed, whilst fish bubbled away in the swim. We were casting over backside vegetation and waterlilies and it took us a while to realise we had to think more carefully about our shot arrangement on the line. By 8am I had caught one decent Perch and loads of small nuisance fish, Rudd and Roach. We decided to head back and collect the keys for the boat we had hired and returned. Once in the boat the whole lake was open to us, though with a few fish still bubbling in our swim we decided to row around and left the boat in the lilies the lake side of the swim. We needed no anchor, the boat was still and we could now fish under the rod tip if we wanted. I putt a single AA shot 6 inches from my hook, I now knew whether the bait was an the bottom and if the bait was taken and the shot moved, it was registered by the float. Bait was a large prawn to deter small fish. After a short time I struck into a sinking bite and felt solid resistance. 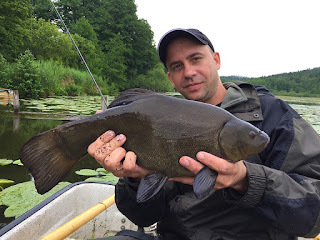 The fish dived straight into weed and after a short and subdued fight Andy netted my first Tench from the lake, a superb, deep fish. It was fin perfect and pristine and I knew it would be a Swedish PB before I weighed it. When I did. the scales went around to 5lb. 6oz. I was well happy. A Swedish PB for me, a superbly conditioned 5lb. 6oz. fish. After this things got easier and we gained confidence in out fishing. 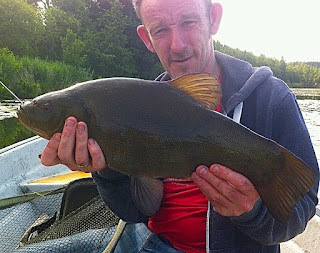 I quickly had three more Tench, around 4.5lb, 4lb and a 3lb Male. These all fought like stink. Andy missed a couple of bites as the sun rose, before the bubbling stopped and small fish began to destroy our baits, even a large prawn eventually succumbed. We decided the give the searing heat a miss around 11am and went to rest for a few hours. Andy's reward for persisting was a stunning Tench, another immaculate dark fish of 5lb.